The understanding of space is probably the most important item in any communication, and especially when the relation between man and architecture is concerned. Space is the given place to exist. It can be equated with the First Quadrant, the realm of the invisible invisibility. Space is nothing and everything and any intervention has to do with architecture. In a more specific notion, it can be stated that architecture is the art of occupying space, based on certain physical and technical principles and the circumstances of the actual project. This process of filling (or even better: fulfilling) is at the heart of every conceivable communication. Space is our cosmic abode where we should feel at home. Gaston BACHELARD (1957/1969) – in his ‘topophilic investigation’ of space – compared the expanse in a poetic way with a nest and/or a shell. It is a place of safety, standing firm to any storm or disaster. ‘La maison, plus encore que le paysage, est ‘un état d’âme’ (The house is, even more than the countryside, a ‘state of the soul’). The nest is (for the birds) a place of return. Of flying out and coming back. And so are the boundless surroundings, in which our presence comes into existence, they are part and parcel of ourselves: we are the space. These (four) ways of coming to terms with space reflect – either conscious or unconscious – a course through different (quadralectic) points of view. Whereas the Space is the all-embracing entity of the First Quadrant, the Volume can be seen as a primary filling of this space in the invisible invisibility of the first part in the Second Quadrant (II, 1). The surface (of a building) is the face of the volume and associated with the first visibility in the second part of the Second Quadrant (II, 2). The Plan is the layout in visibility, derived from the visible visibility of the third part of the Second Quadrant (II, 3). Finally, the Regulations (les traces regulateurs) are, more or less, the subjective recordings of the previous activities in a division-making process, bearing the characteristics of the fourth part of the Second Quadrant (II, 4). Le Corbusier, feeling unfamiliar in the visible invisibility of this last part (II, 4), calls for a remedy against the arbitrary, in the form of an obligation to order. This order has to be – he added cautiously – a mean, and not an end. The regulating lines (‘les tracés régulateurs’) later developed, in his book Le Modulor (1950), into the Modulator. This design tool is a geometric sequence, with a base value (113 cm) and a multiplying factor of the golden ratio. The aim was a design of ‘human’ buildings. Some elements of the (quadralectic) quadrants can be recognized in this summary. The invisible invisibility of the First Quadrant (I) is regarded as a ‘container’ of all other forms of visibility. The invisible visibility of the Second Quadrant (II) marks the first relations between objects (‘ideas’). The visible visibility of the Third Quadrant (III) gives visible lines and the visible invisibility of the Fourth Quadrant (IV) opens a universe of relations. The first option in EKHOLM & FRIDQVIST’s scheme, in which space is fully separated from ‘things’ as an Absolute Space, was advocated, among others, by Isaac Newton: ‘Absolute space, in its own nature, without regard to anything external, remains always similar and immovable. Relative space is some movable dimension or measure of the absolute spaces; which our senses determine by its position to bodies: and which is vulgarly taken for immovable space …’. Modern relativity theory – and therefore modern science – has abandoned the Absolute Space or space as a container and tries to introduce operational definitions instead. The current view of space favors the second option of the scheme in which space is a relation among material objects. Space has, in this setting, a dynamic character related to the static presence of the visible visibility of the Third Quadrant (a material object). Space can also become static itself – as a property of a thing – when it is complete embedded in the Third Quadrant. Finally, space can move into the visible invisibility of the Fourth Quadrant when a static (Third Quadrant) ‘thing’ becomes part of a dynamic multitude and certain spatial properties are required (or acquired). In this latter case ‘space-as-an-entity’ can denote a location where something exists – an area (field) known as a place. The visibility circle is round when an event ‘takes place’ in space, creating a ‘point of recognition‘ (POR) in a quadralectic communication. The representation of space in architecture has been explored in many ways, both on a geographical and temporal scale (CHING, 1979). Every effort found its inspiration (and often also its subsequent execution) in the choice of a particular conceptual division system. This mechanism was not always recognized in the past. For instance, the relationship between the interior and exterior of a building, which plays such an important part in many architectonic evaluations, find its very roots in the oppositional character of the concepts of inside and outside. Architects – and/or their critics, who put these elements of space to the foreground of their concern, should be aware that they operate in the realms of lower division thinking. The church ‘Zur Heiligsten Dreifaltigkeit’ in Vienna (Austria), was designed by the sculptor Fritz Wotruba (1907 – 1975). This building is a good example of the intricate relation between the inside and outside and its final ‘solution’ (fig. 791). Fig. 791 – A view of the church ‘Zur Heiligsten Dreifaltigkeit’ (Church of the Holy Trinity) on the Georgenberg in Vienna, Austria. The building was designed by the Austrian sculptor Fritz Wotruba and built under the direction of the architect Fritz G. Mayr from 1974 – 1976. The shape of the hundred-and-fifty-two massive steel reinforced concrete blocks gives a very personal interpretation of the balance between the inside and outside of a building. The church is 30 meters long, 22 meters wide and 15.5 meters high. The problem of dualism in space was clearly stated by Aldo van Eyck in his contribution to ‘A Miracle of Moderation’ (1968). He made the principle of twinness – gemelliparite – an essential part of his architectural approach (initially inspired by the Dogon cosmology from Mali (Africa). His ‘Twin Phenomena’ points to the exchangeability of Large and Small Space. The adagium ‘the city is a big house, and the house is a small city’ was brought into practice in the building (between 1960 – 1961) of the Burgerweeshuis (Children’s Home/Orphanage) in Amsterdam. The modular building with individual hipped roofs became soon known as the ‘Kafferdorp’ (Cafir Village), indicating that the population understood its African-inspired roots (fig. 792). Fig. 792 – The Amsterdam Orphanage was designed by Aldo van Eyck and built between 1960 – 1961 as an example of his ‘Twin Phenomena’, where space became a place and time was transferred to an occasion. Van Eyck made the following statement with regards to the building, compiling the essence of his thoughts on architectural space. ‘The building was conceived as a configuration of intermediary places clearly defined. This does not imply continual transition or endless postponement with respect to place and occasion. On the contrary, it implies a break away from the contemporary concept (call it sickness) of spatial continuity and the tendency to erase every articulation between spaces, i.e. between outside and inside, between one space and another. Instead, I tried to articulate the transition by means of defined in-between places, which induce simultaneous awareness of what is signified on either side’ (p. 138 in: Udo KULTERMANN (1993). Architecture in the 20th Century). The intention of van Eyck is to ‘shatter the barriers of dualism’ and to add ‘in-between places’ in an opposition. He does not refer to any form of (higher) division thinking, but the emphasis on a line from space (as First Quadrant entity) towards place (as Third Quadrant principle) infers such a width. The move from Universal Time (I) to a given Occasion (III), which is punctuated by intermediate stages, also suggests an appreciation of a wider conceptual space. The phases are conjectured, in the quadralectic way of thinking, as belonging to the Second and Fourth Quadrant. They ‘induce simultaneous awareness of what is signified on either side’. His exchangeability of the Large Space and the Small Space has the same roots as the quadralectic notion that ‘everything is in everything’ (every quadrant encapsules separately the whole communication), but the formal quadralectic law (paradigm) that the Small Space (minor) rules the Large Space (major) is not part of van Eyck’s equation. His fear for the sickness of spatial continuity and the erasure of the difference (articulation) between outside and inside is a direct result of this omission. A universe without boundaries (and its reflection in a building) is not a pleasant thought for any architect, whose task it is to ‘shape the world’. Aldo van Eyck might not have seen the complete reach of his thoughts in terms of division-thinking, he certainly moved away from a narrow, Third Quadrant outlook. A lesser-known design of van Eyck’s hand is the church for ‘Kerk en Wereld’ (Church and World) at Driebergen (The Netherlands, 1963-64), which is instructive of his approach to ‘inner’ and ‘outer’ space (fig. 793). The religious movement, with an openness to the world and a confessed uncertainty about the identity of the Church in modern times, turned out to be the right organization to appreciate van Eyck’s ideas. Van Eyck took the spiritual doubt as a form of ambivalence and translated this feeling in an ambivalent concept of space (STRAUVEN, 1994). Fig. 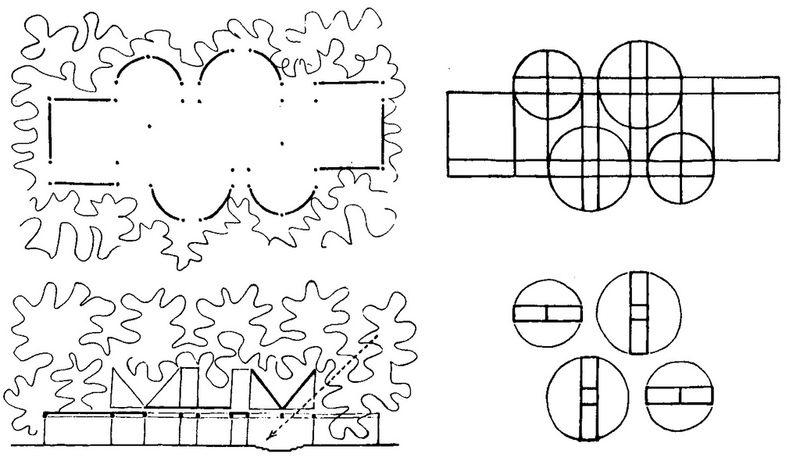 793 – Aldo van Eyck’s design for a community center/church at Driebergen (Utrecht, 1963-1964) was called ‘The Wheels of Heaven’. 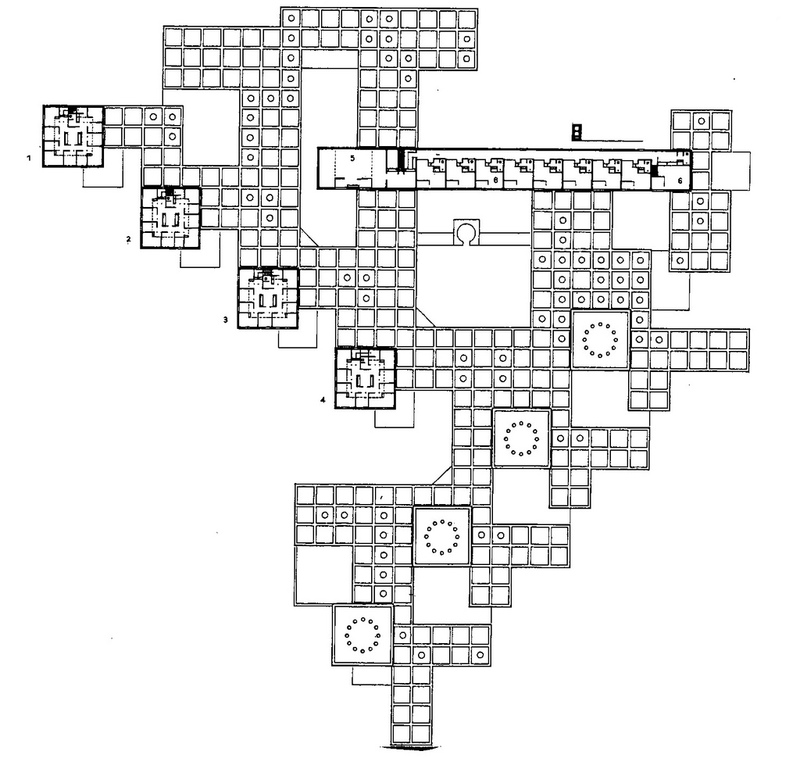 The plan was the outcome of a polycentric concept with four circular spaces. The experience of space can be achieved in several ways depending on the approach of the First Quadrant. One way – from the Fourth Quadrant into a new First Quadrant (IV to I) – is through a modular approach to design. The architect chooses in this latter case a certain unit to form the basis for the creation of space. 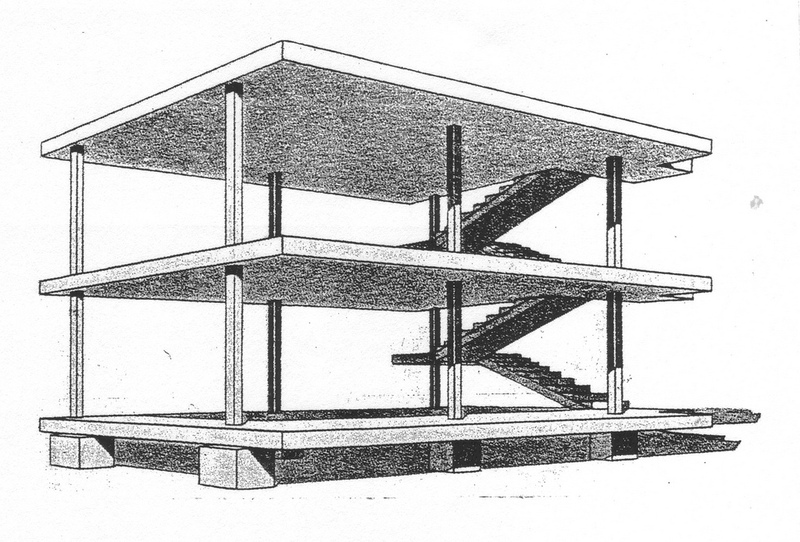 This (single) unit can be a column (like in the hypostyle mosque), or the ‘Domino’-house of Le Corbusier (fig. 794) and many more examples in between. Beauty is the result of a conscious understanding of a shift in observation point to an environment of higher division thinking. The single unit of the Third Quadrant (part) is extended into the infinity of the Fourth Quadrant (multitude). The visible influence of the part diminishes in favor of a feeling of invisibility. This fading identity (of the part) to a new identity (of the whole) might result in a feeling of beauty. Fig. 794 – The ‘Maison Domino’ is a project by Le Corbusier, dating from 1914. The ‘Domino’ house was thought of as a ‘serial’ house (maisons en série), linked up like domino stones. The modular approach aimed at a form of beauty in which an individual part is dissolved in a new multitude. The role of light within a space has attracted continuous attention by architects all over the world. The ever shifting properties of luminescence might act as the moving elements towards a ‘quadralectic’ beauty, which was pointed out before. 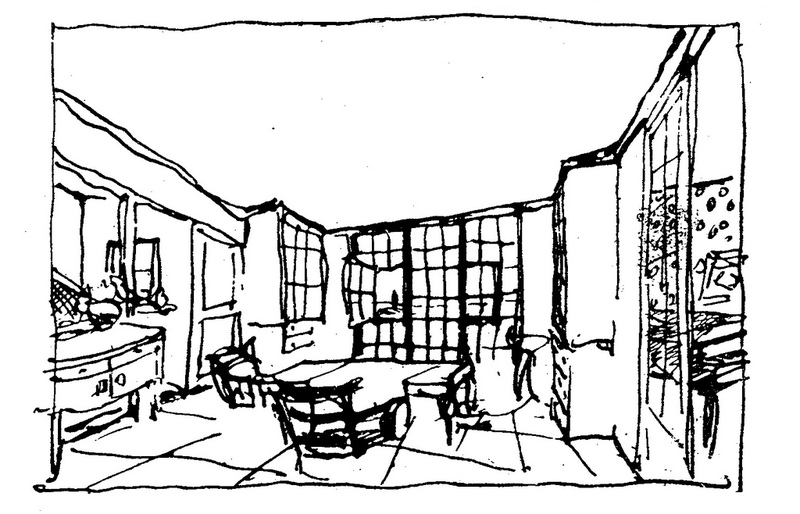 A sketch by Le Corbusier of the interior of the ‘maison-outil’ emphasized the role of light by windows from ceiling to bottom (fig. 795). Fig. 795 – This sketch by Le Corbusier indicates the windows from ceiling to bottom in order to allow as much light into the ‘maison-outil’ as possible. The interiors of the Domino-houses consisted of mass-produced windows, doors and cupboards. The unity of the modules aimed at an architectural harmony, which is reflected in the house itself. Le Corbusier proposed for these houses a moral value, which ‘fitted between the habitations of the riches and those of the poor’. This play with components in architecture – initiated by Le Corbusier in 1915, but with a long, classical history – still has a modern feel. Transparency in space evokes a sense of beauty. The French architect Jean Nouvel (b. 1945) gave a sketch of a court room in the Cité Judisciaire at Nantes (France), which directs the natural light onto the judges’ bench (fig. 796). Although the ‘light humanizes the grid’ it cannot be denied that the light aims at the judges and leaves the audience ‘in the dark’. Fig. 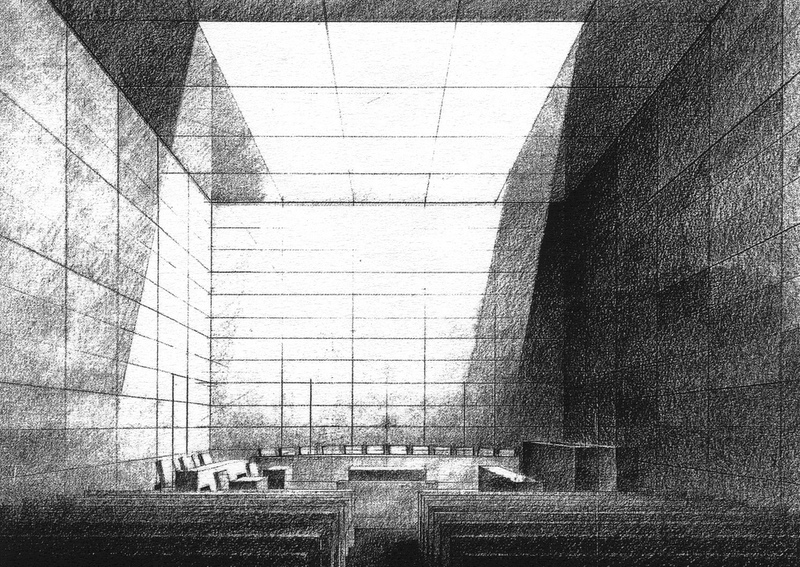 796 – A design drawing (by Jean Nouvel) of one of the courtrooms in the Cité Judiciaire (courtroom complex) at Nantes gives an impression of the importance of light within a confined space. The square building and the scaling of the complex from an 8 x 8 meter grid, is a deliberate statement of even regularity and ‘a visual metaphor for the concepts of fairness and equity, balance and justice that underpin the practice of law’. The grid system is continued in the interior, from the open to the close, from public to private. ‘I am just trying to find the just definition of an architecture of justice’, said Jean Nouvel in his 1993 competition submission for the Cité Judiciaire (courtroom complex) at Nantes (France). The task to combine architecture and law is not an easy one, although it was tried many times before by the Greeks and Romans. Nouvel probably mends to define his architecture of justice in a modern setting, in which the traditional signs of power are made more transparent. ‘Historically, public buildings carried a high semantic content of power; this continued to be so in the twentieth century, in the work of Albert Speer in Berlin and Leonid Semenov in Moscow, for example’ (MURRAY, 1998; p. 43; see also fig. 680). ‘Architecture is no longer an independent act; it is one event in a changing continuum of contexts, a durable event that places an additional responsibility on the architect’. A further investigation into the nature of space took place in Russia, in the short time span after the Revolution (1920 – 1930). Tatlin’s ‘Monument of the Third International’ (1919; see fig. 441) is the best known expression of this burst of activity, aiming to conquer space. In particular the Moscowian school of art and architecture (Vkhutenas) gave in this period great freedom to wild ideas – although still within communistic constraints. 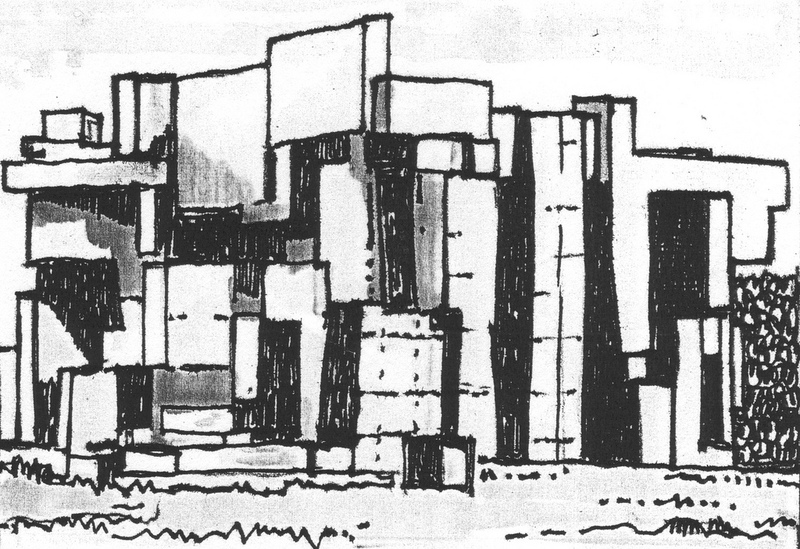 The Ville volante (Flying City) of Russian Constructivist Georgy Krutikov (1899 – 1958) was such an expression of a project, which attacks the space head-on (fig. 797). Fig. 797 – The Flying City Project by the Russian architect Georgy Kutikov was a Constructivists effort to conquer space by architecture. Abolition of private property and an egalitarian approach were hallmarks of the Communist ideology. The initial ideas – as expressed by Karl Marx (1818 – 1883) and others – might have been a genuine effort to shape a sociology of the Fourth Quadrant. However, rapid appropriation of his intentions by a ‘managerial class’ – soon after the uprising in Kronstadt (see BURNHAM (1941) – guided Russia into a society of curtailed freedom. Architecture and music, as essential ‘Fourth Quadrant’ art expressions, suffered badly. Space represents the invisible invisibility in a communication. It holds a spatial order, which can be discovered. The Americans ‘invented’ the sky-scraper to conquer the universe and this psychological element became a part of its functionality. The spirit of vertical movement in architecture was earlier encountered in the cathedrals in Europe, culminating in the High Gothic (around 1200 AD, see fig. 225). A comparison between the cultural periods of Europe (fig. 267) and America (fig. 551) indicates a ‘resonance’ in the fourth part of the Second Quadrant (II, 4). The years 1050 – 1200 AD (in Europe) and 1890 – 1946 (in America) are characterized by an upward movement from the CF-value 6. This latter point, known as the First Major Approach (FMA), marks the greatest advance in a communication. Cathedrals and sky-scrapers are comparable architectural products created in a similar creative spirit within the context of a cultural presence. The Hungarian-born painter, designer and educator Gyorgy KEPES (1906 – 2001) emphasized the importance of space in architecture in his highly influential book ‘Language of Vision’ (1944).